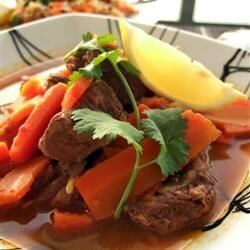 Today, I would like to introduce a wonderful recipe called Lamb Tagine. This is a traditional Moroccan lamb tagine simmered in numerous spices. Don't let the long ingredients list put you off. If you are missing one or two the dish will still turn out fine. 3. If the consistency of the tagine is too thin, you may thicken it with a mixture of cornstarch and water during the last 5 minutes.